Pass the Motion and the Dough - CHARTER SCHOOL WATCHDOG http://www.charterschoolwatchdog. 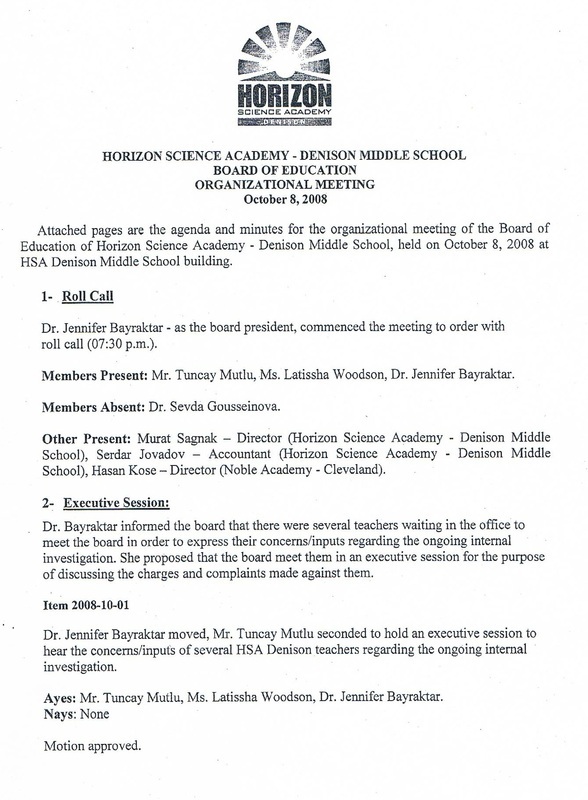 We came across the October 8, 2008, Board Minutes for Horizon Dension Middle School, and have highlighted some of the more interesting topics. 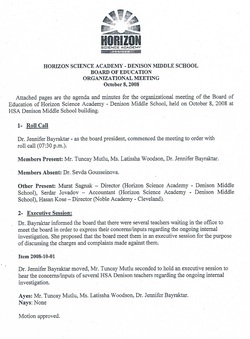 In particular, under Item # 5, the Board agrees to pay $4500.00 to Mark White to investigate the harassment claims made by two Horizon employees. 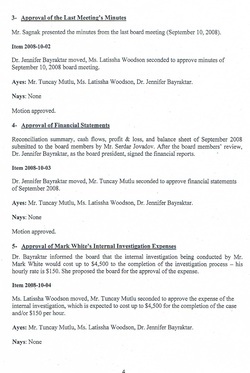 But then jump to Item #7 where Sagnak is requesting that he, the Director (who by the way at the time was supposed to be the Dean of Academics according to his Green Card application), be granted an increase of tuition reimbursement from 75% to 100%. 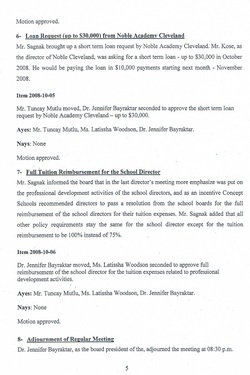 According to Sagnak, "At the last Director's meeting more emphasize was put on the professional development activities of the school directors, and as an incentive Concept schools recommend directors to pass a resolution from the school boards for the full reimbursement of the school directors for their tuition expenses." (For the record, this is a direct quote, don't blame us for the grammar and spelling errors). 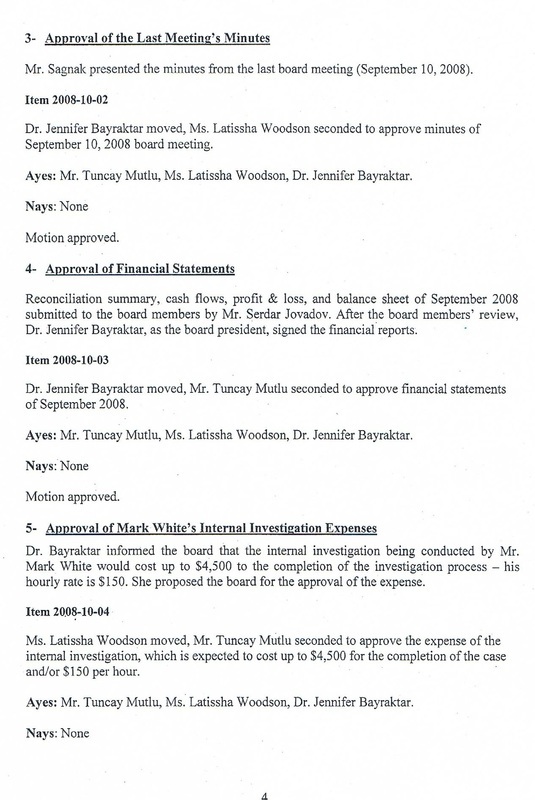 Let's get this straight -- the Director -- Sagnak, who the Board had just approved $4500.00 to pay an investigator to "investigate" harassment claims under his leadership, then asks -- and is given -- a "raise," in tuition reimbursement because all of the Directors (all of the male Turkish Directors), got together over tea and decided that they needed more of an "incentive" to get their graduate degrees -- on our dime. Synopsis -- Sagnak is rewarded for being incompetent (he really should get a government job, he's seems to be very qualified). 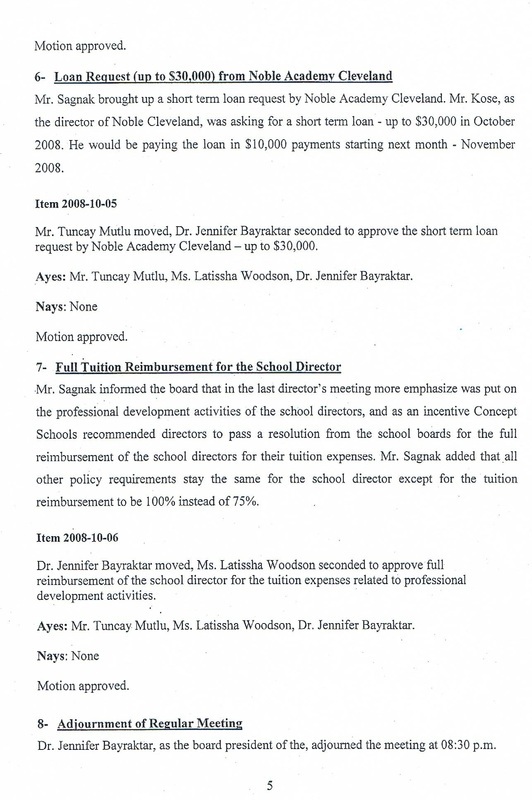 As a side note, under Item # 6, the Board decided to "loan" $30,000 to Noble Academy Cleveland, because according to Sagnak, Noble's Director, Kose needed the loan for his school -- and he promised to repay it at $10,000 a month. Holy Cow! We had no idea that schools could do that, just arbitrarily loan each other thousands of dollars on nothing more than a motion and a second. So we were just wondering if any of the parents or Lucas Country representatives had been present, what they would have thought about the "wild" spending spree that the Board and Sagnak went on during their absence. Note to parents and the public in general: By law, you can and should, request all of the Board Minutes, or better yet, attend a few -- the boys love the company.